Just before Christmas I made slow cooker ham in Cherry Coke which was delicious. I deliberately cooked too much ham so I would have some left for another recipe the next day; if you have leftover ham from Christmas this is a great way to use it up (and any leftover potato and veg you have as well). The quantities are easily adjusted depending on how much leftovers you have to use and how many people you are serving so my recipe is more of a rough guide. Place all the ingredients in your slow cooker apart from the milk and cream, and add enough water to cover the veg. Cook on high for 3 hours or medium for 5-6 hours. When ready, take about half the soup out of the slow cooker and blend until smooth in a food processor. Return to the soup and mix in so it still has some chunks of meat and veg. Add the milk and cream and serve. You can add more water if you want the soup to be thinner but I liked it as it was. I'm sharing this with the Slow Cooker Challenge, hosted by Lucy aka Baking Queen 74 as the theme is Christmas. I'm also sending this to the No Waste Food Challenge hosted by Jen's Food as this recipe uses all sorts of leftovers. What a great way to use up Cnristmas leftovers, soup in the slow cooker is always so good, and your recipe is really versatile. 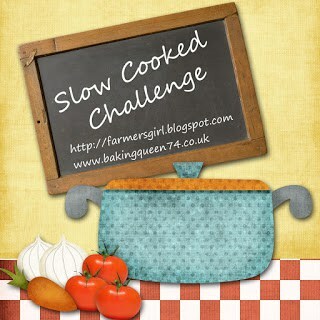 Thanks for joining in with the Slow Cooked Challenge. My dish did not turn out the way I planned.